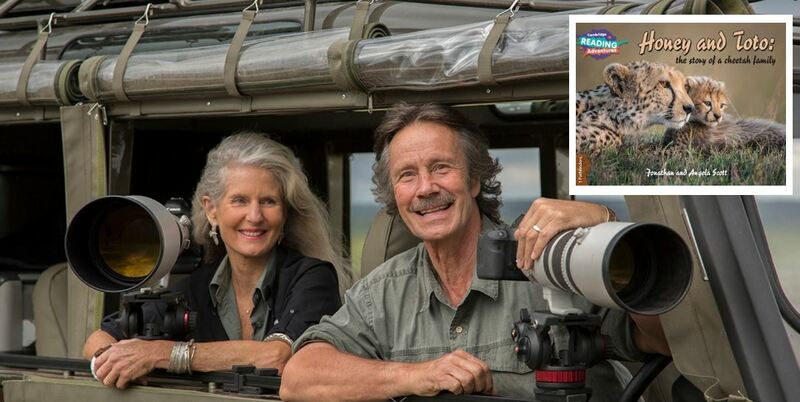 Wildlife photographer, author and television presenter Jonathan Scott – BSc Zoology, 1972 – the 2008 First Trust Bank Queen’s Graduate of the Year, has published his latest book – the true story of a brave mother cheetah (Honey) and her cub (Toto). Honey and Toto: The Story of a Cheetah Family – is a tale of the triumph of courage, and tells how Honey looks after her cubs in the wild through many dangers. Published by Cambridge University Press and co-written with his wife Angie, the book is part of the Cambridge Reading Adventures series, which was launched in April 2016 in collaboration with the International Literacy Centre at the UCL Institute of Education. Toto was first introduced to television viewers in 2005 during Big Cat Week on BBC1 and on which Jonathan was one of the presenters. Jonathan and Angie Scott have lived in Kenya for many years and spend much of their time in the company of African wildlife. Their animal photography, pencil drawings and books have won many awards and widespread recognition around the world. The couple have dedicated much of their lives to conservation and are patrons of a number of wildlife societies. Jonathan gave a keynote presentation at the 2016 Charter Day Dinner, organised by Queen’s Graduates’ Association. His multimedia after dinner presentation on the plight of animals in the Serengeti Desert and the Maasai Mara National Reserve in Kenya where he lives, was well received. He also described how his four years at Queen’s in the late 60s and early 70s were among the ‘best in his life’, saying that his degree ‘gave him confidence’ and that Queen’s allowed him to address his need ‘to be adventurous’. Cambridge Reading Adventures is a Primary reading series. Readers have been grouped into 11 Book Bands providing a clear gradient of challenge from band to band, with increasing complexity in the vocabulary and grammar. Each book comes with comprehensive teacher’s guidance and ideas, with the scheme supported by detailed resource packs. With a wide range of fiction and non-fiction texts, students can choose to learn everything from how to bake bread or to going on an adventure with a pirate queen. All ‘big cats’ face a lifetime of danger in the wild. Honey and Toto: The Story of a Cheetah Family which is available on Amazon explains to younger readers how the brave mother protects her cubs. Winners of many awards and accolades, the Scotts are the only husband and wife in the world to have been named Wildlife Photographer of the Year – Jonathan in 1987 and Angie in 2002. Keep up with Jonathan and Angie Scott on Facebook.